Our theme this week was vegetarian dishes and I received this recipe from Melissa at Lemons & Love. This soup is delicious and is perfect for a quick, easy and filling meal. I made it for myself for lunch, since (as you all know by now) Frank doesn’t eat beans. I really enjoyed it! Thanks for the recipe, Melissa! In a food processor or blender, combine beans, broth, salsa, paprika, hot sauce and cumin. Blend until fairly smooth. Garnish with sour cream, onion and shredded cheese. 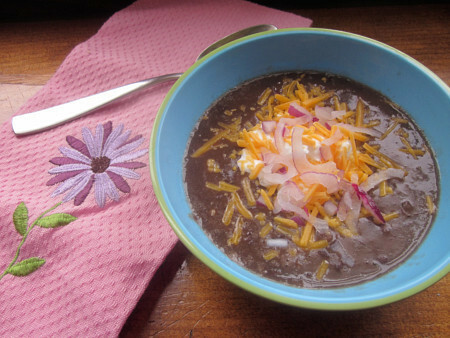 This entry was posted in beans, cheddar, main dishes, Mexican, QuickAndEasy, soup. Bookmark the permalink. It looks delicious, but to make it actually vegetarian you will need to sub the chicken broth for vegetable broth. Hi! I’m having a linky party called A Themed Baker’s Sunday where this week’s theme is cheesecake! I’d love for you to join and link up! If you don’t have a cheesecake recipe, I’d love for you to come back for this next weeks theme, which is tomorrow, and it’s cakes and cake pops! ktkimmle, you’re right – if you look at the original recipe, it’s offered as an alternative. I love soup, Melissa, and this looks like a good one. Thanks for sharing it!